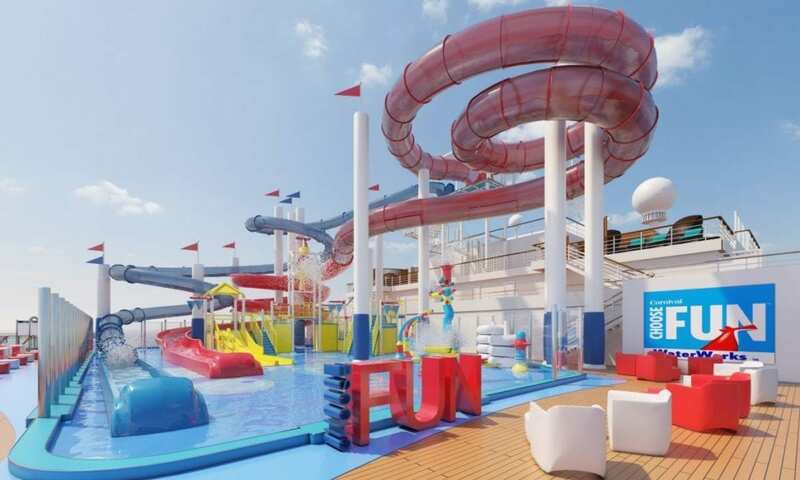 Carnival Cruise Line’s CFO Shaquille O’ Neal (Chief Fun Officer, that is) helped announce the exciting new feature of Carnival Panorama — the “Choose Fun” aqua park — in a very witty and “splashing” video late last week. “As Carnival’s Chief Fun Officer, my job is to make sure guests are having the time of their lives on board, and I can personally attest that Carnival Panorama’s Choose Fun aqua park will be the funnest at sea!” said O’Neal. The Choose Fun aqua park — which takes its name from the Carnival brand’s slogan — will offer two water slides (the Red Fun measuring in at 455 feet and the Blue Fun at 300 feet), a 300-gallon PowerDrecher tipping bucket, a kiddie spray park, and more. The family-friendly feature also brings more Carnival Cruise Line favorites like SportSquare and SkyRide. If you’re wanting to experience what Shaq can only describe as “fun, fun, and funner,” then you’ll want to know a little bit more about the ship. Carnival’s Panorama ship is currently under construction in Fincantieri’s Italian shipyard. She is scheduled to begin sailing out of Long Beach California in December 2019 — marking the first new Carnival Ship to homeport in the West Coast in over 20 years. Sailings will start out with year-round, seven-day Mexican Riviera voyages (following the inaugural three-day voyage), which will feature stops in destinations such as Mazatlan, Cabo San Lucas, and Puerto Vallarta. Will you be joining Carnival’s “CFO” for some “very very, very very, very very fun” watersliding?